I've worn glasses for most of my life. I'm nearsighted and I've got moderate astigmatism as well. I think I got my first pair at around 8 or 9 years of age, when my teacher realized I couldn't see the text on the blackboard. I've been completely dependent on glasses ever since. This has never bothered me — glasses work well and they add a bit of character to my face. Me and my current pair of glasses. But a few years ago I started developing presbyopia, so I've been using bifocals, glasses that let you see far through the upper part, and focus close through the lower. Or that's the theory. I need to correct my astigmatism as well, so the lens design becomes a compromise. I really only see well along a narrow vertical strip in the visual field. I have to move my head constantly to read or use a computer. 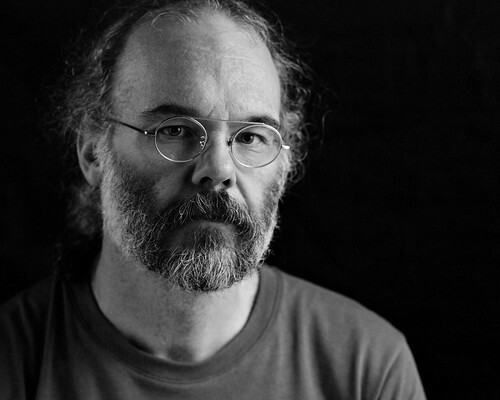 In practice I need two pairs of glasses, one pair for seeing far, and a second pair that give me a wide field of view close up. Two pairs of glasses to fumble with on the train and at work yet still never seeing really well - now that is a bother. A few weeks ago, an acquaintance blogged about his LASIK surgery here in Japan, and that prompted me to take a look for myself. With LASIK you cut open a flap in the surface layer of the cornea, then reshape the cornea itself with a laser1. At first they only corrected nearsightedness. Then they started to correct astigmatism but only the overall shape, not smaller irregularities. As a result people would often get minor side effects such as low contrast and glare at night. No real problem compared to bad eyesight, but I was happy with glasses so I saw no need to rush. But now I'm no longer happy. It's now possible to do a much more precise correction than earlier. With the latest methods you map the light paths through the eye, then calculate how to reshape the cornea to correct not just the major errors but smaller irregularities too. That should reduce the risk of visual side effects. This weekend I went to the Kobe Kanagawa clinic in Sannomiya for an eye exam. The exam took over an hour but was mostly a sequence of "put your chin here, look into this machine. Don't blink. Great! ", as various machines measured my visual errors, pupil size, corneal thickness, intraocular pressure and other parameters. I also got a careful manual eye test and a medical eye exam. My vision problems are moderate, I've got above average corneal thickness and no other eye-related issues. LASIK surgery should suit me fine, and my cornea is thick enough to do a second corrective surgery if the first one isn't perfect. I will still need glasses when reading or when I use a computer or tablet2. But it would be simple reading glasses, with no need to switch between pairs. And I could go completely without glasses when going out for walks, taking pictures, or when swimming, snorkeling or skiing. I have a date for surgery next month. The actual procedure takes only ten minutes or so, but I start eye drops three days beforehand, and have follow-up exams and wear protective glasses for a week afterwards. The vision will apparently not stabilize fully for a month or longer, so I will need a temporary pair of reading glasses until I can fit new lenses to my regular pairs. A bit nervous, but I'm looking forward to it. #1 The cornea — the hard, transparent cover in front of the pupil — is really the main lens of the eye, and the one that does most of the focusing. The soft lens behind the pupil that we think of as "the" lens is much weaker, and there only to adjust the focus. Long holiday this year, so we went travelling over Christmas and New Year. We hadn't seen my parents in years, I have a nephew I've never met, and Ritsuko had never experienced Christmas in Sweden. So it seemed a good idea to visit my parents and my brother in Borlänge. Then we'd escape winter for the balmy seas of Krabi in southern Thailand and celebrate New Year in Ao Nang. It's really two separate trips, so I've split this account into two as well. 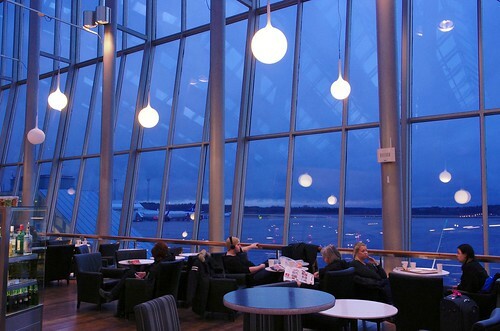 Arlanda airport, mid-morning. Welcome back to the gloom and the silence. We flew Thai Airways via Bangkok. That way we could stay both in Sweden and in Thailand and take the return trip between Bangkok and Krabi, all for little more than a straight trip between Osaka and Stockholm would have cost us. But it meant we had to pass by Bangkok at every leg. Bangkok and Osaka are almost the same distance from Stockholm so it adds something fierce to the total travel time. It took us 38 hours door to door between home and my parents. 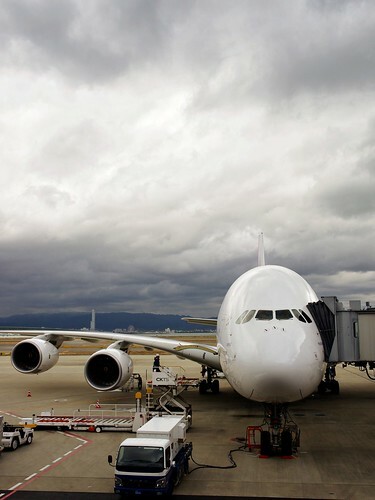 The Airbus A380. Big airplane. Comfortable. Did I mention it's big? Thai Airways now use the new, huge Airbus A380 on the Osaka-Bangkok route, while Bangkok-Stockholm is with a Boeing 777. The interior is exactly the same in both aircraft and we had seats in the same area for both flights, so it was interesting to compare them. The A380 is smooth and very quiet. I use ear plugs when flying, but not in the A380. In the 777 you need to raise your voice over the constant noise when you talk to each other. But in the A380 you can speak completely normally, even during take-off. Also, I usually get dried out when I fly. I constantly drink water, wipe my face with wet towels and use so much hand lotion I leave grease marks on my tablet. But on the A380 I never needed any of it, so the air quality seems much improved over older aircraft. The Bangkok lounges have showers — the single best thing you can do after a flight to refresh yourself — and we slept well on the 11-hour Bangkok-Stockholm flight but we were still quite tired and jet-lagged when we arrived. Unfortunately Sweden was suffering a heat wave and there was not a snow flake to be seen. I think Osaka was colder than Stockholm during Christmas. The train to Borlänge was completely packed with holiday makers, but at least it was on time. 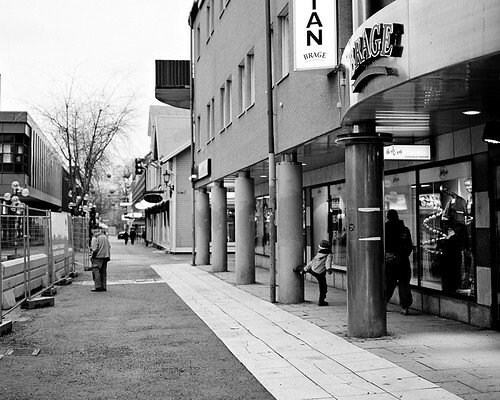 Central Borlänge. Still feels the same as always, for good and bad. We stayed with my parents and visited my brother and his family. We met my nephew for the first time, as well as my brothers in-laws. Christmas in Sweden is mostly about eating and drinking, with a bout of gift-giving on Christmas eve. Most foods aren't all that strange — most people are fine with ham, meatballs, salmon or gratins — and as you serve it buffet style you can pick and choose whatever you like and ignore the rest. And of course there's piles of candy, chocolate, nuts and dried fruits if you get peckish between meals. Hot Christmas food. 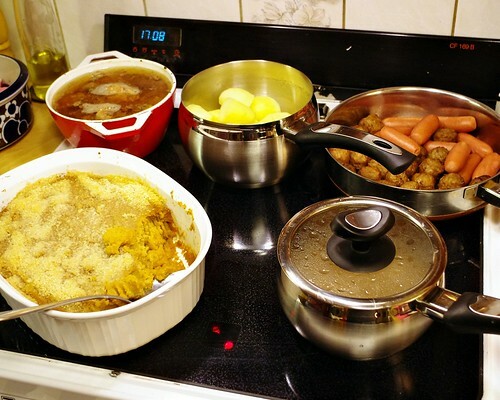 From top left Kareilan meat stew; potatoes; meatballs and sausages; cabbage gratin; and dopp i grytan. Perhaps the most fun for me was to experience Christmas through the eyes of Ritsuko. A lot of familiar, everyday foods and traditions are exotic or completely unknown to her. Herring salad, rice pudding, dopp i grytan (rye bread quickly soaked in ham broth) and julmust were all completely new experiences. The single most strange event to her was when everybody stopped to watch a Disney animation. When it first aired in the late 1950's it was pretty much the only animated cartoon you'd see on television. Then it became a yearly tradition, and now it persists for no other reason than because you've always done it. We middle-aged people could all recite the lines by memory, but my niece and nephew have a fire-hose of cartoons at their fingertips through the net and showed no particular interest in the show. I guess this tradition will gradually disappear over the next generation or so. Lunch restaurant at the Kupolen mall. That whole area is all new since I moved from town. We spent a bit of time in Borlänge itself; I had to walk off a bit of all the heavy Christmas food if nothing else. An old childhood friend happened to be in town with his family, and I got a rare chance to meet them for lunch. Fun to see each other again, and I was happy to see he's acquired the good taste of growing a beard. Visiting Borlänge is always a little disorienting to me. All the contours of my childhood town — streets, buildings, some shops — are still there. I can still find my way around. But it's like looking at it through a fun-house mirror; distances are shorter and buildings are smaller than they used to be. The whole town seems to have shrunk, almost alarmingly so. And everything is a confusing mix of new and old blended together. I can't even take proper pictures; it's all both intensely familiar and completely new, and I don't know how to approach it. 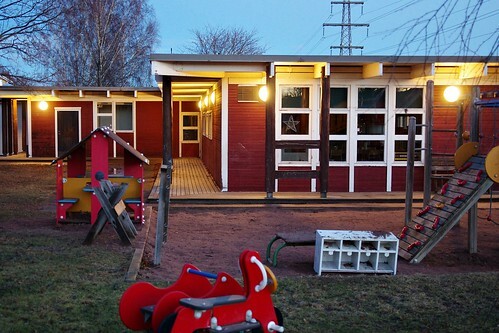 Amazingly, my old preschool is still there, and looks just like I remember it. This was mid-afternoon, by the way, but with no snow it never gets properly bright outside. The weather was dismal. There'd been snow earlier in the winter, but now it was unseasonably hot and it had all melted away again. And without the white snow to reflect light even midday is gray, dark and gloomy, and night comes before you realized that the morning is over. This winter gloom is one thing I don't miss at all. The long, long summer days do make up for it, but even then it's never as bright as in southern latitudes. 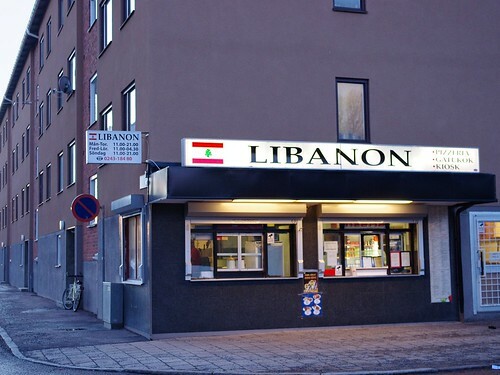 Restaurant Libanon. This captures the atmosphere of Borlänge quite well. 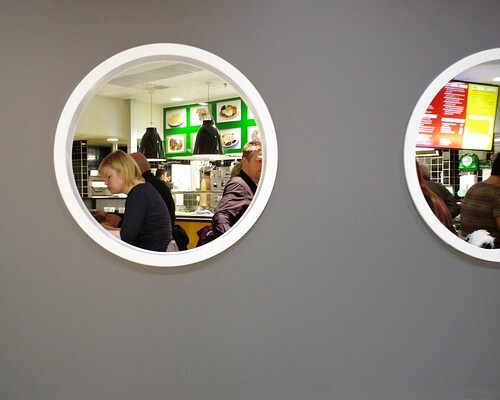 Borlänge train station diner. I love this kind of place. Pytt i panna, a fairly typical dish. Diced potato, onion and cheap meat fried up and served with egg and pickled beets. We do make this at home now and again, but the diner atmosphere really adds to it. 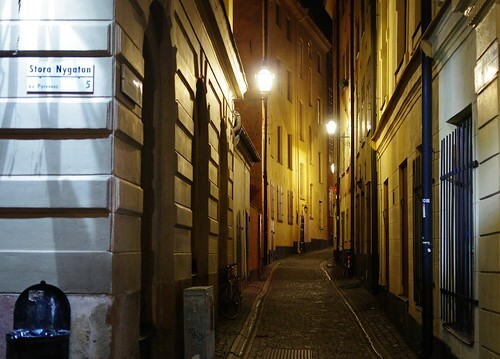 We spent one night in Stockholm. The Swedish railways are not very dependable, and we can't trust them to get us to the airport on time. Especially in winter, during peak travelling season. One snowstorm and we'd be stuck for days. Better to take it easy. 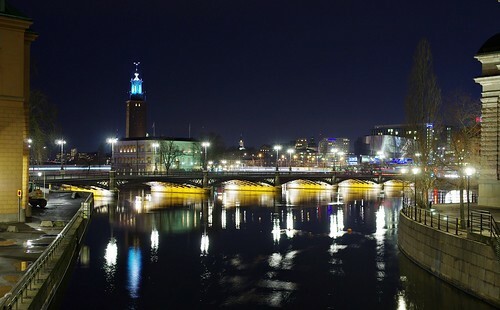 Besides, it's always fun to spend some time in Stockholm when we have the chance. It's a beautiful city. Stockholm from the parliament with the city hall in the background. No snow here either. 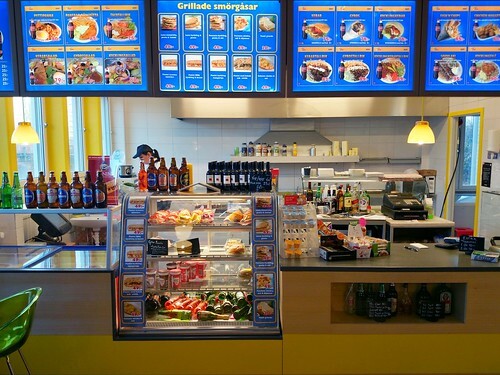 There's quite a lot of street food in Sweden, though I never appreciated it properly. 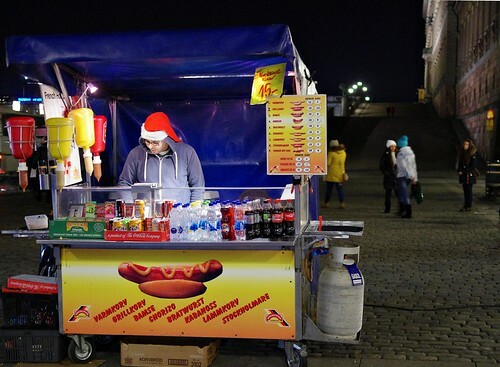 From hot-dogs to burgers, kebabs and more exotic food, you can find something to eat just about anywhere. And cafes and bars put tables and chairs outside any chance they get. I wonder why Swedes like eating outside so much, despite cold winters and rainy summers. 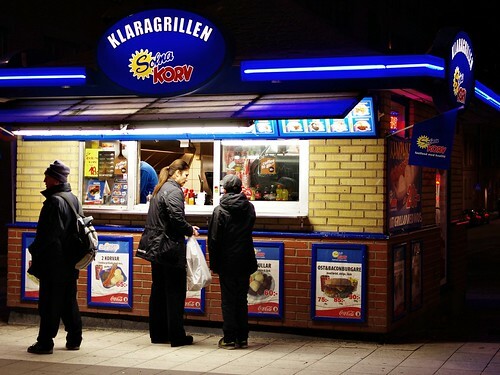 A street grill along Drottninggatan, Stockholm. Sausage cart. I don't envy the guy spending hours every day in that cold, windy spot. The royal palace in the background. Why is that girl dressed as a panda? I have no idea. 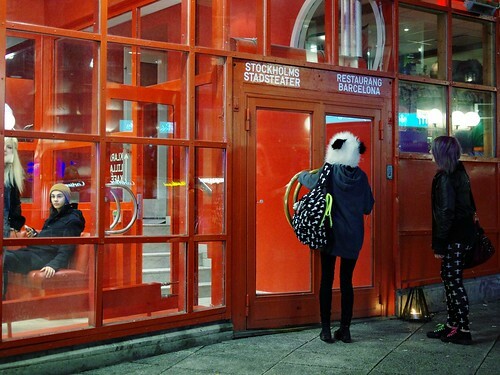 Stockholm city theater restaurant. Nordic Sea Hotel. Picture wallpapers seem to be back in fashion. We stayed at Nordic Sea Hotel. It's really convenient; the entrance to the airport train is just next door, so we don't have far to go the next morning. The breakfast buffet is wonderful, with lots of good bread, cheeses, fruit and other stuff. The front desk staff has been unfriendly and unhelpful every time we've stayed here but you only have to deal with them for check-in so it's no big deal. 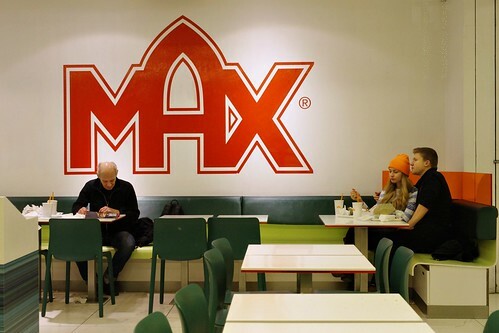 The Max hamburger chain. It's pretty good, though we didn't have a chance to eat there this time. 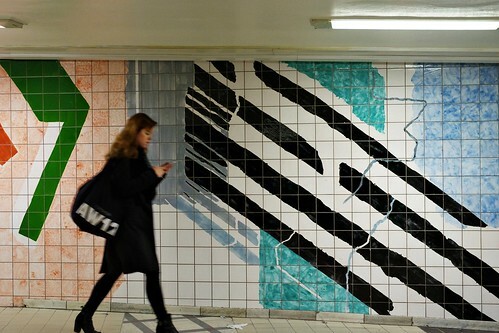 Stockholm subway. Many stations have murals and other decorations. 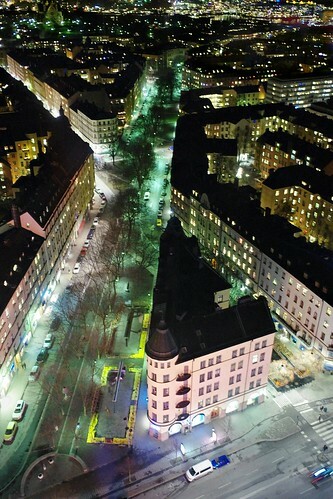 The Söder area of Stockholm. Stockholm was cold and dark (of course) but it's fairly busy with lots of shops and restaurants and things to see and do. It's well worth taking a few hours to walk through the city, though you want to dress warmly if you do. Next up — once I've finished editing the pictures — is our new year in Thailand. Still working on the travel posts ("posts", plural; it was getting way too long for a single post), so here's a quick, easy to read paper on how we make riskier decisions for others than for ourselves. In short, even when we have no intention of hurting or defrauding anyone, we still make riskier decisions when the impact of failure falls on other people than when they fall on ourselves. When we make decisions for ourselves, we tend to use strategies that minimize the possible loss. That makes sense; losing what you have can be devastating, and not worth the possible gain of something you never had. Imagine a lottery where you have a 50:50 chance of either losing your home, or winning a second, identical one. Nobody would play; a second home is not worth nearly as much as the first one. But shift the odds to, say 1:10 of losing your home and 9:10 to get the second one and still very few people would take the gamble even though strictly speaking it's a good bet. We are fundamentally loss averse, and for good reason. But as this paper shows, when we make decisions for others we tend to choose riskier strategies, and no longer feel that loss aversion. The important point of this paper to me is that the participants had no reason at all to favour one strategy over the other. They were honestly trying to make the best decisions possible. It's pretty likely you have the same effect in real-life situations; say, when you advice a friend or family member about some investment or other money decision. You are likely to give them riskier advice than you would follow yourself. And you're likely to receive riskier advice as well. Worth keeping in mind. We're back from our holiday travels. It got a little more exciting than we expected and I have a huge pile of pictures to go through so don't expect a blog post about it just yet. But meanwhile, I just finished reading Half Life, the first thriller novel by Patrick Sherriff, also known as Our Man in Abiko. He is finishing up the sequel, so he's been posting the book on the net, one chapter at a time. Hana Walker is a "hafu" orphan, that is a Japanese born of one Japanese and one foreign parent. She stumbles onto a job finding the half-Japanese daughter of a Mormon, and has to finish it ahead of the local Yakuza, during the aftermath of the 3/11 earthquake. This is a good read. It's his first novel as far as I know, so it has some rough edges. A couple of scenes don't really work and the plot has a fair share of holes in it (any thriller storyline is well ventilated of course; it goes with the genre). But it's smooth reading with some unlikely and interesting characters, from circumstances you don't normally see in this kind of book. You can get the ebook at Amazon on the above link, or start at chapter one and read through it online for free. Then you can join me in waiting for Patrick to finish the sequel already and see what Hana and uncle Kentaro get up to next.